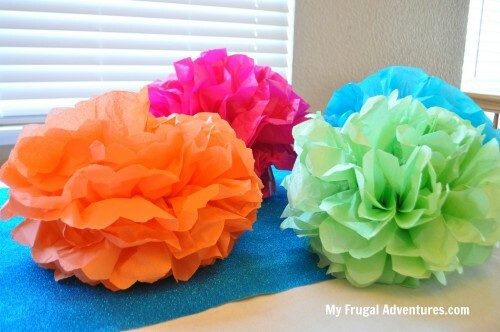 I mentioned the free Lowe’s Creative Ideas magazine yesterday and wanted to mention a really simple and really inexpensive project idea for a party. This idea was from the magazine and it is such a clever one I wanted to share it. Anyway, this really did come together super fast and has a ton of impact for a party. 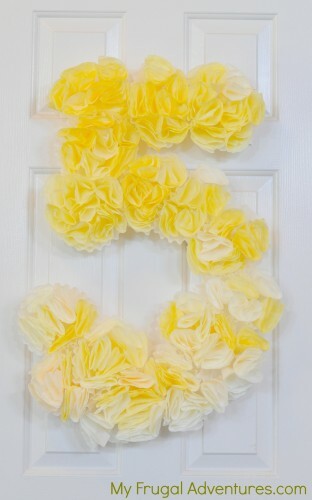 These signs are s fun for a party- you can use shapes, letters, numbers… whatever fits your theme. I have done lots of numbers for children’s birthdays and recently a giant heart for Valentine’s Day. This requires about an hour to 90 minutes of time, a package of coffee filters, some hot glue and foam board. Simple! I have made these several times now and so I have a few different methods that have worked out to great results. You just write the number or letter or whatever on your foam board (I did a freehand 5 for my 5 year old). You will need a nice sharp knife or scissors to cut through the foam board. It doesn’t have to be perfect and I have used poster board in the past. Poster board is easier to cut but it doesn’t hang quite as nicely and doesn’t hold up quite as well as foam board. 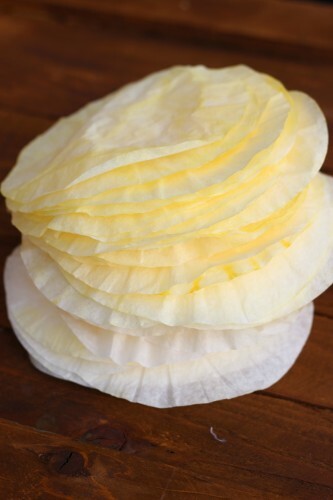 Next you want to decide how to color your coffee filters. I have done this two ways (and by the way white looks really pretty too so leaving them plain is totally an option). 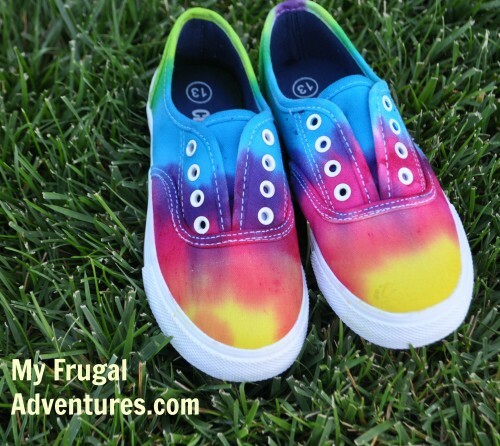 The first idea is to go ahead and leave them white until you finish the project and then take a can of spray paint and paint the color of your choice. You can see the blue #5 below was done this way and here is a puffy heart I made for Valentine’s Day using red spray paint. What I don’t like about the spray paint method is that it makes the coffee filters a little heavy and the filters don’t look as light and airy. The second method gives you a much nicer end result but it does take a little extra time. I added about a cup of water to a small Tupperware and then several drops of food coloring. I wanted a somewhat ombre look to my sign so I started with a few drops and worked my way up in batches to about 9 drops of food color for nice dark color. I simply mixed the food color and the water in the bowl and then pulled each coffee filter apart and soaked them in the bowl for anywhere from 5 minutes (very light color) to an hour. I did this in batches of about 15 filters at a time. The filters need to dry so I had an old kitchen towel on the counter and spread them out for about 30 minutes or so and then just stacked them up once they were pretty dry. This is a little tedious but I did it all on a Sunday afternoon when I was puttering around the house on various projects anyway. 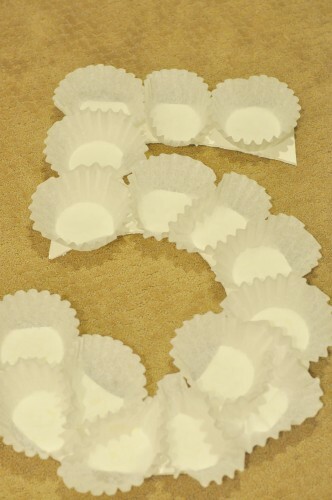 You can certainly do larger batches at once- I would just suggest pulling the filters apart when you put them in the food coloring rather then dunking a thick stack in. I love how this made the sign look in the end and I highly recommend this method if you can spare the time to hand color your filters. 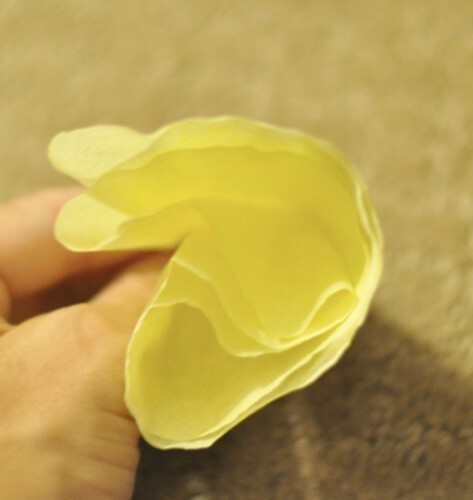 In the end it will look like lovely crepe paper flowers. This process of coloring makes the filters easier to work with in the end so I think it saved me time in gluing to the foam board. Note you can use regular school glue however it is very tedious as you need to wait for it to dry for each step. Hot Glue works SO much better and it adheres everything instantly. Next you want to fill in those circles with your colored coffee filters. I used yellow for mine and the white filters blended in just fine. If you are using a super bright color and you are worried about the white not blending in you can always add a bit of the food coloring and water to a spray bottle and spritz at this point so the white filters get color. Either that or you’d need to dip these one by one in the color solution bowl so that the shape stays the same and they aren’t flattened out. (I hope that makes sense). Next put that pile of filters in front of you and get to work! I did my entire sign while watching a rerun of The Voice- so it took me about an hour to assemble. First your filters will likely be a flat pancake shape. Fold them in half to create a semi circle and in half again to form a triangle and in half once again for a small triangle. Make a tiny bend at the pointed part of the triangle. This is what your triangles are going to look like– that bended part is where you will put a dab of hot glue to adhere the filters down. Just before you actually glue them down take a second to fluff your filters so it looks a little full. Just really quickly do this and in the end it saves time as you won’t need as many filters to fill in your circle. 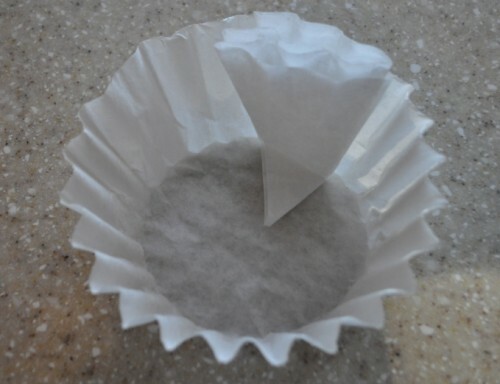 Keep doing that over and over until your coffee filters are all filled in and it looks nice and ruffley. I had about 5 or 6 of these little triangles per circle. And now you are done! You may need a few dots of glue here and there to make things look perfect but overall the sign should look great! If you decide on the spray paint route, just head outside and use thin coats to spray evenly on your sign. And then the yellow sign at the top is my little girl now turning 5 using the food coloring instead of spray paint. In person these look really fantastic and whenever I make them for parties I get a lot of compliments– so well worth the time investment :). This is really cute, I have a party for my 4 year old in a few days and I’m going to try this. CUTE! My Dollar Store sells foam board…I’ll have to keep this idea in mind for the next birthday party! Do u use glue stick or hot glue gun and how to you hang it up? 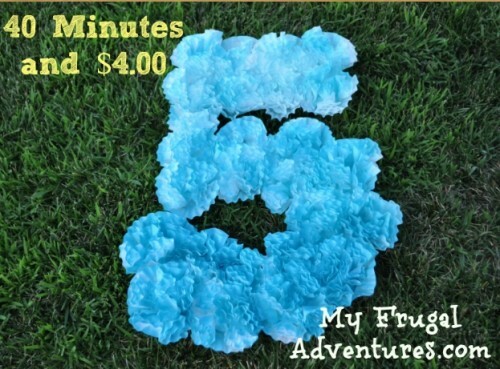 Love “40 Minutes and $4” ! 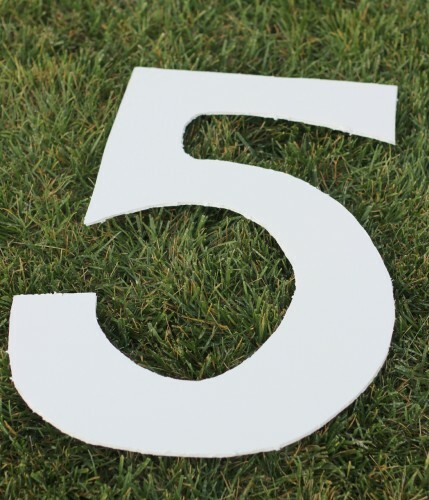 Save Adrianna’s 5 sign until she turns 15 — then reuse the 5 & she can make the 1. Cute bday tradition! I used Elmer’s glue that is .25 right now and I stole it from my daughter’s backpack :). I don’t think a glue stick will hold those filters but you could try. I was thinking hot glue too and I am sure that might work better but I think it would make a really messy project. You have a zillion filters to glue. But I would try whatever you have on hand right now. Great idea with great results. When I 1st saw the picture I thought it was done with cupcake liners until I could see it closer up. Thanks for sharing.